Photos courtesy of Dan Dolan Studios. 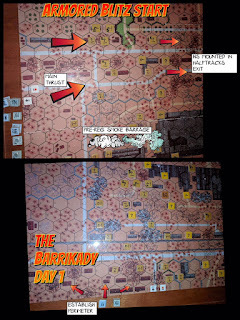 Break out your Red Barricades map and follow along as Rich Spilky and Bob Brown discuss campaign game III with the author of an article that provided Rich with a winning strategy. Dan Dolan's article was published back in 1993 in a fanzine called Fire for Effect that was published by Marc Hannah. It is fun to hear the three of them discuss the game and the fact that Rich was using his "radio" to stay in contact with Dan (who provided the wonderful photos, by the way). The 2 Half-Squads is brought to you by Bounding Fire Productions and Ritterkrieg and of course, kind donations from you. Please subscribe to us on Patreon. I'm about as new to playing ASL as a guy can get and wanted to let you know I've been listening to your show for about a month now during my commute. Started with the current issues but am now listening to them from both ends ( up to 128 from the bottom and about 185 from the top). I absolutely loved this episode! I have the Red Factories on Pre-order and am really looking forward to it now. Hope to see you continue well beyond episode 200. Thanks for the kind words. You must have a lot of stamina to endure our productions. Rich, Dan and Mike did a wonderful job indeed in bringing us a clear and thorough look at RB CG III. Thanks again! So close to episode 200! It will be a milestone in history, like Queen Victoria's Jubilee! Seriously though, I hope you two know how much we appreciate all the years of hard work you've put into this! It doesn’t take much to stop the river side blitz. First, as the Russian I ALWAYS fortify the W10 and put one of the ATG in the upstairs. Then all you need are 3 trenches...V5, X5, Y3. This completely stops the threats of the infantry laden HT. And it doesn’t take a lot of resources. The ATG and the trench in V5 is SOP any time I play the Rssians and it doesn’t soak off much resource from the West. Thanks for the great tactical tips........and for listening. The success Rich had in this game was due more to his being a very good player. He was able to take my skeleton of a plan and make it work on the ground. It was fun watching,it unfold and see it succeed against a good player. I have used it several times but this was the first I’ve seen someone use and change it. Great episode. You have the FFE article posted? 11.6061 EFFECT ON UNITS:23 In a type B Isolated Area each enclosed SMC must attempt to Escape (11.6063). In a type C Isolated Area each enemy SMC must attempt to Escape. In a type C/D Isolated Area each unit/Weapon enclosed begins the next scenario with Ammunition Shortage (A19.131) [EXC: Escaped (11.6063); Eliminated (1l.6094-.6095, 11.610, 11.6132 and 11.6134-6136)]. The ID of some may need to be recorded to distinguish them from others not suffering the same penalties. It is only in a Type B isolated area that they have to escape. C and D, they get ammo shortage. Unless there have been some errata since my copy was made. Hey Jeff and Dave! Congratulations on broadcasting for 10 years! Quite an accomplishment!! Great episode, as always. BTW - "FLICKR" links to a "404" page not found message, so we cannot view photos associated with this podcast. Just curious if Dan's FFE article is available anywhere online?